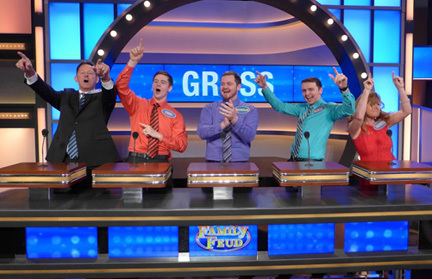 Mark and Theresa Gross of Defiance and their three sons, Patrick, Nicholas and Christopher appeared on Family Feud, Monday, January 28, 2019. The show was actually taped in June, 2018, and at the time, the family didn’t know if, or when, it would ever be broadcast. “All along the way, they tell you there is no guarantee you will be on TV,” Theresa said. 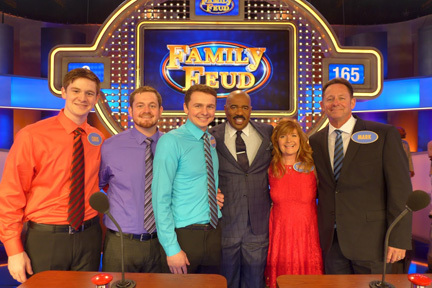 The process started in 2017 when son Patrick applied, unbeknownst to the rest of the family, to be on the show. Several months later, in August, 2017, the family auditioned – along with hundreds of other families – in St. Louis. Theresa said her son Nicholas and his wife Laura are swing dancers. During the introduction, Laura joined Nicholas on stage and they danced for the audience. The family was thrilled to see that segment was included in the broadcast. They’ve remained in contact with the Klein family, exchanging text messages and planning a possible future get-together. Both families scheduled viewing parties for Monday evening, and then “face-timed” each other during the broadcast.